Neural tube defect (NTD) is the most common congenital malformation leading to spinal cord lesion. It contributes to motor and sensory deficits below the level of the lesion. According to the hospital-based studies in different cities of India, the prevalence of NTD in India varies from 0.5 to 11/1000 infants. Myelomeningocele (MMC) is the most severe and the most common NTD. In normal development, environmental exploration helps in the development of motor and social skills. This also promotes advancement of perception and cognition which is obviously noticed in typically developing infants. In children with MMC, there is significant limitation of mobility also sometimes no mobility in the first few years of life subsequently leading to limited independent locomotion in the future. Immobility not only affects musculoskeletal and cardiovascular system but also limits child's exploratory activities which play vital role in cognitive and social development, ultimately affecting the quality of life (QOL) of the child as well as the family. Bartonek et al. in their study on health-related QOL in children with myelomeningocele in a Swedish population have stated that children with MMC perceived lower score in health-related QOL due to the limited ambulatory functions. Mobility is the utmost important factor for independent and productive life. When ample of mobility aids are available in market in India for differently able people, they all are mostly benefitting to young age. There seems to be no self-mobility chair available for MMC child of very young age. These kids, though having normal intelligence, are always deprived of self-mobility and carried by the caregiver therefore causing burden on the family. Hence, efforts were taken to design a self-mobility chair for a child with MMC at early age to improve his mobility, independence, and self-image. Further aim was to facilitate child's engagement in functional activities and activities of daily living (ADL) and to see the effects on QOL of the child as well as of parents. Perceived Stress Scale (PSS) was used as an outcome measure for the same. Perceived stress scale suggest higher parental stress for higher score. The study further extended to find out the significance and effects of this chair on functional independence of the child using International Classification of Functioning, Disability, and Health (ICF) model. This model aims to provide the scientific basis for understanding and studying health and health-related states, outcomes, and determinants. A 2½-year-old male child, diagnosed with L1 level MMC with hydrocephalus, was referred to occupational therapy department from pediatric neurosurgery department for rehabilitation. MMC closure and ventriculoperitoneal (VP) shunting were done at the age of 2 months of life. VP shunting was revised twice till the age of 2½ years. Despite nil neurological involvement of the upper body (head, neck, trunk, and upper extremities), the child demonstrated limited upper extremity functioning and poor trunk control, predominately due to inactivity, disuse, less environmental exploration, and prolonged hours of lying down postures on bed. However, his cognitive skills were age appropriate. Mother informed about his limited communication and social participation, restricted to only family members and regular visitors. The child was cranky and clinging to mother. He was totally dependent on family for indoor as well as outdoor mobility. The child was presented with significant motor impairment. Bilateral lower limb was flaccid with poor voluntary control. Both feet were in talipes equinovarus deformity. Tone of trunk and trunk stability were poor. He was unable to roll over, sit, stand, or walk independently. He was unable to move around independently in home and outside. Reaching and manipulation skills were poor, so there was inability to maneuvering objects in sitting position. The child also had poor initiation and participation in play activities. Furthermore, he had poor communication and poor social participation. He was completely dependent on caregivers for self-care and eating activities. He was referred from pediatric surgery for splinting and rehabilitation. [Table 1] shows periodic clinical findings, therapeutic intervention, and gradual improvement after occupational therapy intervention. 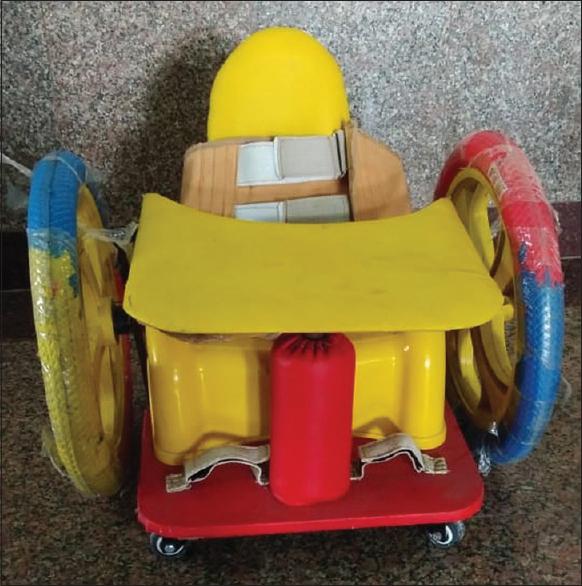 After regular intervention for almost 6–7 months, when the child developed good upper extremity strength and trunk stability and could transfer himself to wheelchair, this self-propelling wheelchair was given to the child. This chair was fabricated with objectives to improve mobility and functional independence. Chair was fabricated using potty seat, which is a readily available market product. This was fixed on lightweight, sturdy wooden plank with attached pair of castors in front and back at the base of the plank, and a pair of hand driven rubber tire wheels on both the sides of wooden plank. To maintain upright posture of the trunk, the chair was fitted with an extended backrest with niwar belts for fastening, if needed. It was also provided with detachable lap board for facilitating upper extremities functioning [Figure 1]. The child was trained to use this chair under supervision of the therapist initially and then provided for home use under supervision of caregivers. This self-mobility chair used upper extremities' functional mobility and good cognition of the child and made it possible for the child to explore the surrounding as freely as age-matched normal children. The child was assessed at the beginning, after 3 months, after 6 months, and at the end of 1 year after providing the self-mobility chair using the ICF model. Parental Stress level was checked using PSS before providing the chair and after 1 year of its use by the child. [Table 2], Part 1, shows analysis per the ICF for body function, structure, and environmental factors. [Table 2] shows improvement in body functions and structures of the child, as per ICF model, which were affected due to congenital condition of the child. After the intervention, the child showed increase in mental functions, mainly in attention and sound sleep. Furthermore, improved appreciation of touch and pain sensation. Significant changes in the attitude of extended family members and friends after intervention were observed on improving the mobility of the child. [Table 2], Part 2, shows activity limitation and participation restriction in pre- and postintervention status. In this table, assessment was done based on the capacity qualifier and performance qualifier. As seen in [Table 2], Part 2, significant improvement was observed in the child's ability of learning and mobility. The child's capacity qualifier has improved in all ADL skills due to the change in his body position. The child has also shown improvement in his performance qualifier in self-care activities after using a mobility chair. The intervention has also improved his communication, play, and leisure activities with others leading to facilitation of social life and community participation. [Table 3] shows pre- and poststress level of parents. It has found that parental stress level decreased to 28% on PSS as compared to 60% before providing the child with self-mobility chair. Children with hydrocephalus have significantly impaired learning, memory, and executive functions hampering cognitive development. In this case, significant improvement has been noticed in mental functions from severe impairment to mild impairment mainly in attention and emotional functions. These findings are consistent with the study of Uchiyama et al. which states that independent locomotion enhances psychological functions such as cognition, memory, and social–emotional development. Improvement in manipulating task, lifting, carrying, and using hand for ADL shows that postural stability influences reaching tasks. In this case, abdominal belt is provided which child can use when needed for trunk support to allow optimum trunk stability and freedom for performing functions in all possible directions in sitting position. Physical restrictions leading to decreased social participation affect QOL. To improve QOL, rehab program aiming maximum independence is recommended. Mobility chair was preferred over full-length orthosis as the child had low-level MMC. Researches state that most of the children with thoracolumbar MMC, who walked with orthotic devices eventually, gave up walking as teenagers and choose wheelchair for more energy efficient means of locomotion. This self-propelling mobility chair has also helped the child to learn wheelchair maneuvering skills in early age [Figure 2]a and [Figure 2]b. The goals and specific modes of mobility will be changed as per physical size, cognition, personal and family preferences, and functional and social needs of the child. Improved interpersonal interaction and relationship in community and social life has been documented. Calhoun et al. stated that immobility decreases ability for learning and socializing and promotes feeling of helplessness due to decreased ability to have an impact on the environment. On the other hand, mobility provides a means of exploring the environment, which is linked with coping, self-awareness, shift in patterns of attachment, and interaction with caregiver. Significant decrease in parental stress level after improvement in child's mobility has been also reported on ICF. Severe physical limitations and dependency affect QOL of caregiver, thus rehabilitation focused on improving mobility of the child is suggested by many researchers. This case report suggests that early age self-propelling mobility chair provides young children with independent functional mobility at the same age as their peer group, benefitting social and cognitive growth and interpersonal relationship and boosting self-esteem. It is also important to note that this chair serves not only as a medium to move around but also as a therapeutic tool to improve motor, cognitive, social, and psychological goals. Mobility learned in one context that is in home will transfer to other environment promoting a dynamic interaction with their world. This case study was conducted adhering to the principles of the Declaration of Helsinki and written informed consent obtained from parents. She has suggested modification such as provision of stop guards to this chair in future for enhancing stability and prevention of hazards and injuries. The suggestions can be accepted and fulfilled as and when needed. The authors certify that they have obtained all appropriate patient consent forms. In the form the parents has/have given his/her/their consent for his/her/their child's images and other clinical information to be reported in the journal. The parents understand that their child's names and initials will not be published and due efforts will be made to conceal their identity, but anonymity cannot be guaranteed. Rai SK, Singh R, Pandey S, Singh K, Shinde N, Rai S, et al. High incidence of neural tube defects in Northern part of India. Asian J Neurosurg 2016;11:352-355. Bartonek A, Saraste H, Danielsson A. Health-related quality of life and ambulation in children with myelomeningocele in a Swedish population. Acta Paediatr 2012;101:953-956. Berry JD, Jones WH. The parental stress scale: Initial psychometric evidence. J Soc Pers Relat 1995;12:463-472. World Health Organization. ICF-CY full version 2007. In: International Classification of Functioning, Disability and Health (ICF). Geneva, Switzerland: World Health Organization; 2001. Lindquist B, Persson EK, Uvebrant P, Carlsson G. Learning, memory and executive functions in children with hydrocephalus. Acta Paediatr 2008;97:596-601. Uchiyama I, Anderson DI, Campos JJ, Witherington D, Frankel CB, Lejeune L, et al. Locomotor experience affects self and emotion. Dev Psychol 2008;44:1225-1231. Peeters LH, de Groot IJ, Geurts AC. 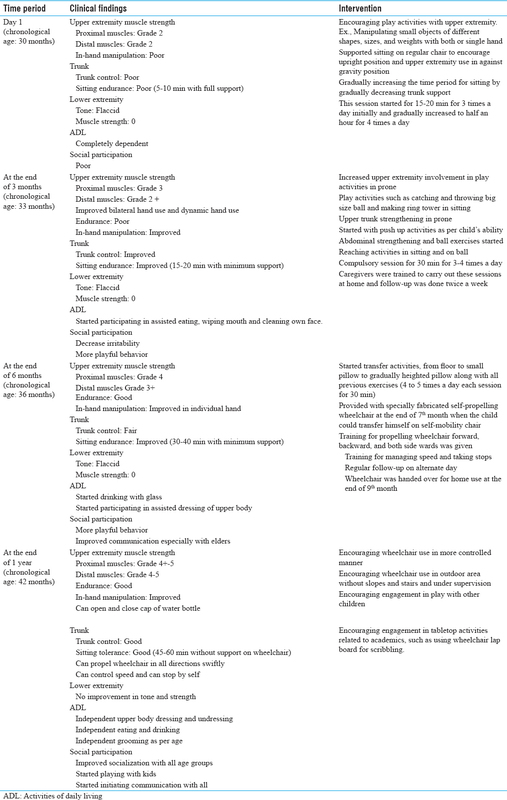 Trunk involvement in performing upper extremity activities while seated in neurological patients with a flaccid Trunk – A review. Gait Posture 2018;62:46-55. Bahriye T, Yulay TS. Relationship between functional level and quality of life in children with spina bifida. Int J Phys Med Rehabil 2013;1:136-140. Mazur JM, Kyle S. Efficacy of bracing the lower limbs and ambulation training in children with myelomeningocele. Dev Med Child Neurol 2004;46:352-356. Calhoun CL, Schottler J, Vogel LC. Recommendations for mobility in children with spinal cord injury. Top Spinal Cord Inj Rehabil 2013;19:142-151. Bannink F, Idro R, van Hove G. Parental stress and support of parents of children with spina bifida in Uganda. Afr J Disabil 2016;5:225.